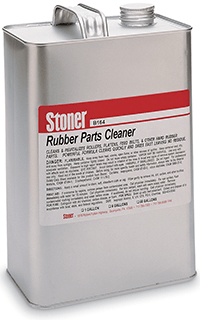 B164 Rubber Parts Cleaner restores a soft, dull tack to drive belts, platens, rollers, and other rubber parts, providing better traction and more efficient operation. Revitalizes moving rubber parts and prevents slipping. Keeps platens from getting slick and shiny without harming sensitive rubber. Removes correction fluids too. Powerful but gentle formula cleans quickly and dries fast leaving no residue. Gives a pleasant citrus scent, not a harsh solvent smell. Won't dry-out rubber like other brands. Pour off into smaller bottles for field service applications. Simply swab or wipe onto rubber parts for fast cleaning action. Have you used Rubber Parts Cleaner?